The best hearing impaired telephones offering patented features not found in other phones. Our telephones offer amplified volume and specialized controls to give you the best performance and experience in telephones for the hearing impaired / hard of hearing / loss of hearing. When you buy a telephone from Hearing Impaired Phones our 100% satisfaction guarantee will help you rest comfortable that you have made the best purchase possible. Wall Brackets for Deskset and One Piece Phones. Our phones offer patented features such as the Volume Boost Button aiding 70% of Elderly Persons with High-Frequency Hearing Loss (The Boost Button Increases Volume Range To 27.5db). Additionally, our phones have built in CLEARING AID ® circuitry which automatically adjusts frequency response for improved clarity. This is an aid to 70% of people with high-frequency hearing loss sometimes referred to as "hard of hearing". Don't be left out of the conversation because of telephones that don't provide increased volume or the ability for two people to share the same phone call at the same time. 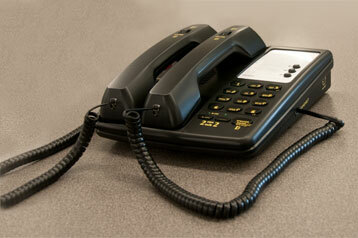 The 2 Can Talk 2 - dual handset phone is an ideal addition to our hearing impaired phones selections. 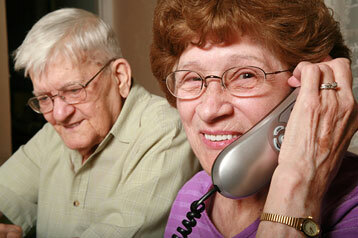 We sell telephones for the hearing impaired that you can trust and will appreciate for years of quality service. For over two decades, Med-Pat has been a leading supplier of telephones and telephone accessories to hospitals and healthcare facilities nationwide. Widely recognized for our superior engineering, exceptional quality, innovative design and operational features, Med-Pat telephones are now available for home use, including our new, patented hearing impaired telephones for the hearing impaired. As you travel our site, please be reminded that all of our products are designed, manufactured and serviced by Med-Pat and are backed by our 100 percent guarantee of customer satisfaction. If you are looking to buy hearing impaired telephones for the hard of hearing you have come to the right place.